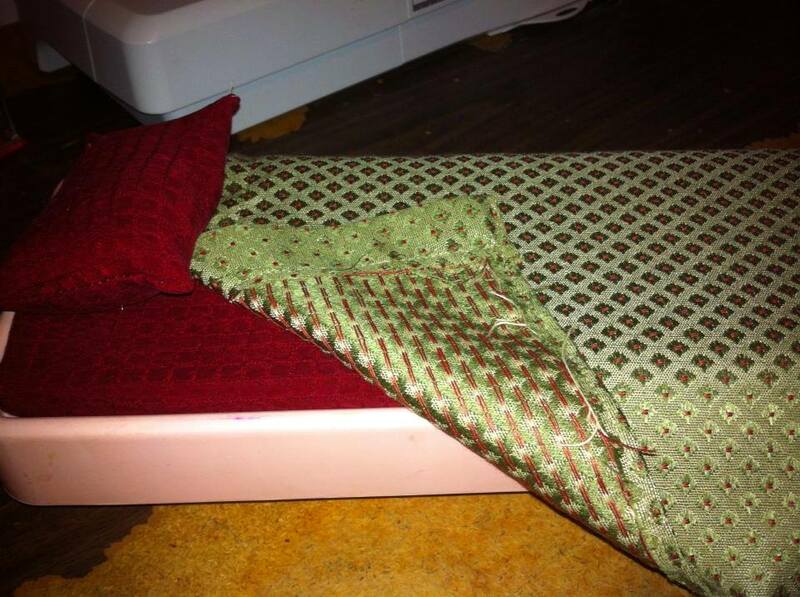 A friend of mine asked me to make her bestie a new bed set for her Barbie doll bed. They were re-doing the theme of the entire doll house and this room has reds, golds, and greens! Awesomeness. Pillow – Cut a piece of fabric 6″ by 4.5″. Fold this in half on the long side and sew all but one side. Turn rightside out and stuff with poly fiber fill. Turn under your seam and sew shut. Fitted sheet – I did not add elastic to the corners but this pattern worked. Cut a piece of fabric 14″ by 6.5″. Turn under 1/4″ around all edges and sew along these edges. Put the mattress pad in center of the piece of fabric on the wrong side. Mark where the corners are with a chalk pencil. On the wrong side, sew a 90 degree dart on each corner. Do this by pinching each dot you made and align the side and top seams near that dot. Sew down towards the seam. Trim the excess off and turn to the right side.